There are many options for remodeling a basement. You can create a high-end design, matching the upstairs of the home in every regard. Or build a basement using recycled materials and inexpensive options. The average cost per square foot for an existing house is roughly $15 to $20. This cost jumps to $20 to $35 per square foot in a new house, according to experts on CostHelper.com. Look at basement designs in home design books and remodeling magazines to get ideas. Design something visually appealing and scale back to fit a budget. Basic framing and drywall will hide many basement issues. 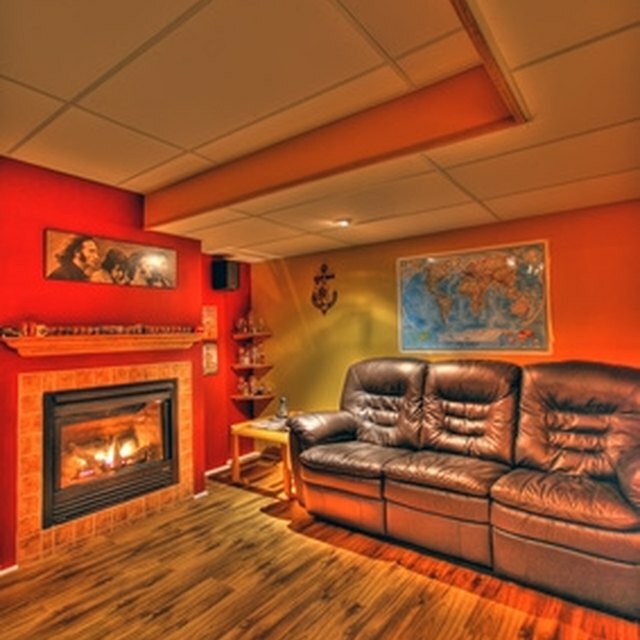 Remodeling a basement is less expensive than standard remodeling. This is due to the fact that a basement has flooring, wall structure and ceiling space already in place. The basic costs of framing walls to divide rooms will include the cost of 2-by-4-inch boards, electrical wiring to route through the walls and drywall. You might wish to add amenities to a basement bath area. For example, if you include a whirlpool, high-quality cabinets and expensive tile work, you can spend $15,000 or more. To keep costs low, scale back to simple main fixtures, such as a pre-made shower or shower-tub combo. Simple sheet vinyl flooring is less costly than a tile floor. It's possible to purchase bath materials at close-out sales or in classifieds to complete a bath for less than $2,000. If you will need to add a heat pump, this can increase remodeling costs of a basement by $5,000 or more. Paying someone to run ductwork and vents to basement rooms will be added to this cost. For a 2,000p-square-foot basement, these costs alone can add $3 or more per square foot to overall costs. If you try to extend the upstairs heating and cooling to the basement, it will overload the unit serving the main part of the house. Space heaters, such as oil-filled radiator types, can be used instead to save money. Figure the cost of all construction materials, electrical and plumbing needs and many small details. Some items will have little cost flexibility. If your budget is tight, look for ways to save on flooring, light and bath fixtures, which will have cost flexibility. If initial remodeling costs total $26 a square foot, you might be able to reduce this to $22, for example. This is an $8,000 savings on a 2,000-square-foot basement. One way to complete a basement remodel to include high-end materials is to work in stages. Construct a beautiful basement with ceilings, walls and a bath area finished. Install sheet vinyl flooring now but wait to install hardwood flooring in a couple of years, for example. At a future date, add a bar area, media wall or kitchen. Plan upgrades as your budget allows. How Do I Design a Garage Layout?